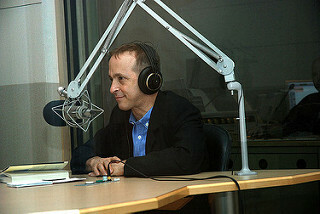 David Sedaris is a frequent guest on the late-night TV show circuits. He has a sister, Amy, who is also a writer and a comedian. Comedy-wise, I have preferred Amy over her brother, but David’s latest book, Squirrel Seeks Chipmunk, has made me take a second look at his work. David was born in 1956 in Johnson City, NY. He attended Western Carolina University and the School of the Art Institute of Chicago. Besides Squirrel, he has written a half dozen or so books of humor. I found his latest work to be rather evenly funny, with only a very few duds. The book opens with “The Cat and the Baboon.” David writes, “The cat had a party to attend, and went to the baboon to get herself groomed. // ‘What kind of party?’ the baboon asked, and she massaged the cat’s neck in order to relax her, the way she did with all her customers. ‘Hope it’s not that harvest dance down on the riverbank. My sister went last year and she said she’d never seen such rowdiness. Said a fight brock out between two possums, and one gal, the wife of one or the other, got pushed into a stump and knocked out four teeth. And they pretty ones too, none of this yellowness you find on most things that eat trash.’ // The cat shuddered. ‘No,’ she said. ‘This is just a little get-together, a few friends. That type of thing.’ // ‘Will there be food?’ the baboon asked. // ‘Something,’ the cat sighed. ‘I just don’t know what’ (3-4). Not every one’s cup of tea, but funny nonetheless. The title story of the collection is one of my favorites, “The Squirrel and the Chipmunk.” He writes, ‘The squirrel and the chipmunk had been dating for two weeks when they ran out of things to talk about. Acorns parasites, the inevitable approach of autumn: these subjects had been covered within their first hour, and so breathlessly their faces had flushed. Twice they held long conversations about dogs, each declaring an across-the-board hatred of them and speculating on what life might be like were someone to put a bowl of food in front of them two times a day. ‘They’re spoiled rotten is what it comes down to,’ the chipmunk had said, and the squirrel had placed his paw over hers, saying, ‘That’s it exactly. Finally, someone who really gets it’” (16). And finally, the crown piece of this selection, “The Mouse and the Snake.” Sedaris writes, “Plenty of animals had pets, but few were more devoted than the mouse, who owned a baby corn snake—‘A rescue snake,’ she’d be quick to inform you.” [ ] ‘I’m sorry to barge in on you this way,’ the toad said, ‘but a few of my babies has taken off and I’m just about at my wit’s end.’ She blew her nose into her open palm, the wiped the snotty hand against her thigh. ‘They’s girls as wells as boys. Nine in all, and wasn’t a one of them old enough to fend for themselves.’ // […] ‘Well,’ the mouse said, ‘if you were that concerned for the safety of your children, you probably should have kept an eye on them’” (43,45).